You can use chicken in place of the turkey, if desired. Preheat oven to 350 degrees F (175 degrees C). 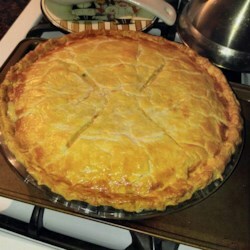 Line a pie plate with 1 prepared pie crust. Stir turkey, vegetables, chicken soup, half-and-half, salt, and black pepper together in a bowl. Pour into prepared pie plate and top with remaining pie crust. Slice 4 slits in the top of the crust to vent. Bake in the preheated oven until heated through and crust is golden, 40 to 45 minutes.